Since its founding in 1859 by Belgian-born Louis Jadot, this estate In Burgundy, France, has been considered one of the greatest producers of white wine in the world. It's certainly true from the standpoint of the wines that we've tasted from Louis Jadot. Around the turn of the 20th Century, Jadot made some excellent investments, buying up the greatest Grand Cru vineyards in the area. This would be almost impossible today. The price of his vineyards would probably run into the hundreds of millions of dollars. The winemaking laws in Burgundy are quite strict. From one section of land, you're only allowed to make so much wine which bears the name of that appellation. Anything more, and it has to be labeled as a generic. Such is the case with this wine. 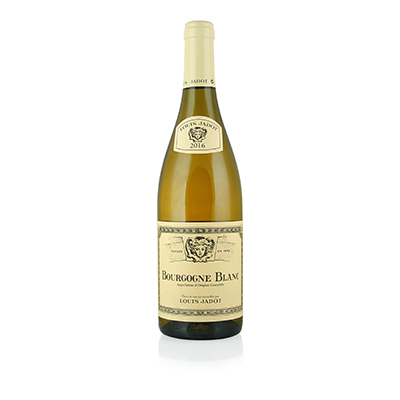 They won't tell us which vineyards our selection came from, but considering the holdings of Jadot, chances are that the wines from those vineyards typically sell for five to six times more than the price of this Bourgogne Blanc. In other words, Jadot probably makes the best Bourgogne Blanc there is. If someone had told me this was a $50 Puligny-Montrachet, I don't think I would've questioned it. This wine says Burgundy from the very first sip. Here's the final resting place of Chardonnay. Insanely beautiful flavors of green apple, pineapple and citrus form a perfect union on your palate. It finishes with the signature flavor of the magical soil from which it hails.